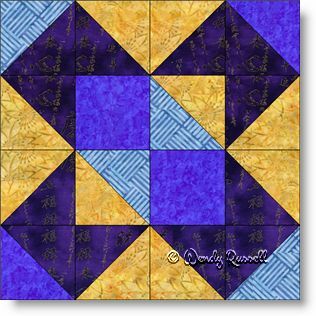 This four patch quilt block is a slight variation of the Chisholm Trail quilt block. By a simple different arrangement of the light, dark and medium values of the fabrics it appears to be a totally different block. The block features simple patchwork, using only squares and half square triangles. The sample quilt layouts show two very different quilts. One quilt uses a side by side block setting, while the second quilt sets the quilt blocks on point. Both quilts use sashing to separate the blocks, with very different results.